Every day there are more projects guided by Latinos who now live Anchorage. That is the case of Mexican journalist Gabriela Olmos who arrived in Alaska two years ago. In 2009 she wrote a book called “With Closed Eyes, dreams of indigenous children.” Thanks to her work we now see, in the streets of this corner of the north pole, large murals of immigrant children. In them we can see just how big you can dream. Ojos Cerrados (Closed Eyes) is a project carried out by Gabriela and Shirley Mae Staten, of the organization Keys to Life Alaska. It deals with the immigrant and refugee children who live in Anchorage. For the project they interviewed 69 children, of different nationalities, who attend the Anchorage the School District. They asked the children about their dreams: what do they dream for their future? what do they dream for their family? what do they dream for their community? what do they dream for the world? Four Hispanic / Latino children were part of this project. With these interviews they wrote stories and, with those stories, 19 large-scale exhibition murals (4x8 feet) were built. Each mural is composed of a photograph and a story. The photographs, most taken by Colombian photographer Oscar Avellaneda, and the personal story of each child written by Gabriela are what make up each piece. “The panels will transform the Anchorage community into an atlas of our combined cultures and heritage.” The goal of the project is to create closeness and affinity among the population of Anchorage and open up new possibilities for conversation based on the inspiring stories of children. 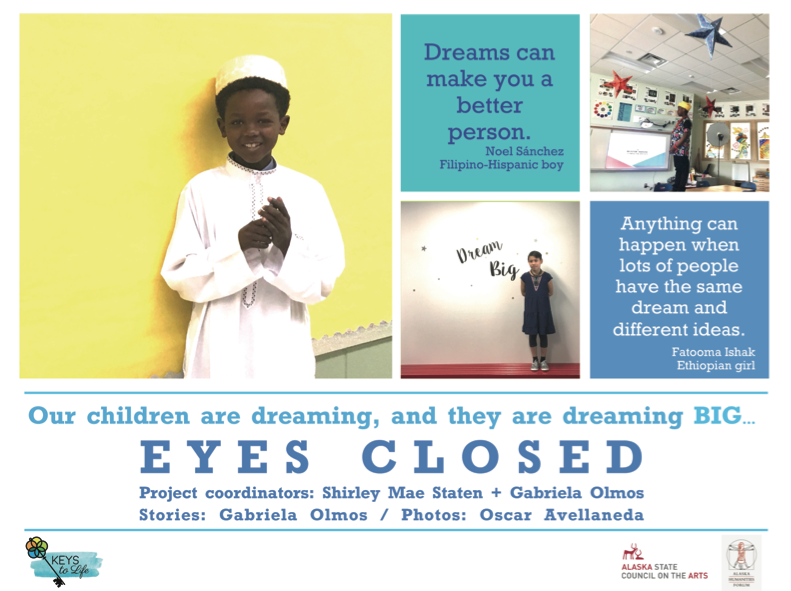 Gabriela says that with this project they want “people to bet on their dreams, to learn to dream big.” It was only when they began to transcribe the interviews that they realized the children were building a better world. One of the children interviewed wants to make a shelter for the homeless. A girl dreams of being president of the United States to fight for the civil rights of people. Another little girl wants to be an astronaut, while another little one dreams of being the best businessman in the city and of the country. So, one by one these children make us believe that we can hope to live in a better world. When Sol de Media Noche interviewed Gabriela, we were introduced to Antony from the Dominican Republic. 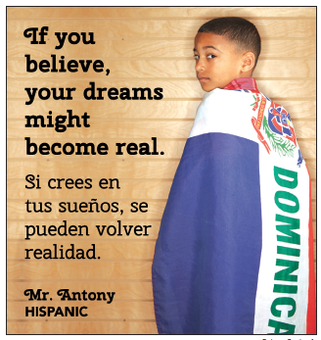 Antony is eight years old and he told us, in Spanish, that he felt “good” when asked about his dreams. He assures us that his dream is to help people by being a policeman because he worries about security. He knows there are thieves outside and he wants to solve this problem. “One day we left home and then went back to look for my sister’s glass that we forgot. Then I saw someone bad who was taking out the garbage outside. I told my aunt not to go there that there was a thief, my aunt called the police.” From that moment Antony wants to be a policeman. The panels will be on display until September 2019 and are located outside the Anchorage Museum, the Loussac Library, the Mountain View Library and in Peratrovich Park. They will be in plain view so that everyone can see and read them. These and other inspiring stories of the children of Anchorage can be seen, in addition to the murals already exposed, in a full-color book consisting of 19 children’s stories. The book will be launched on December 7, 2018 at the Museum of Anchorage.